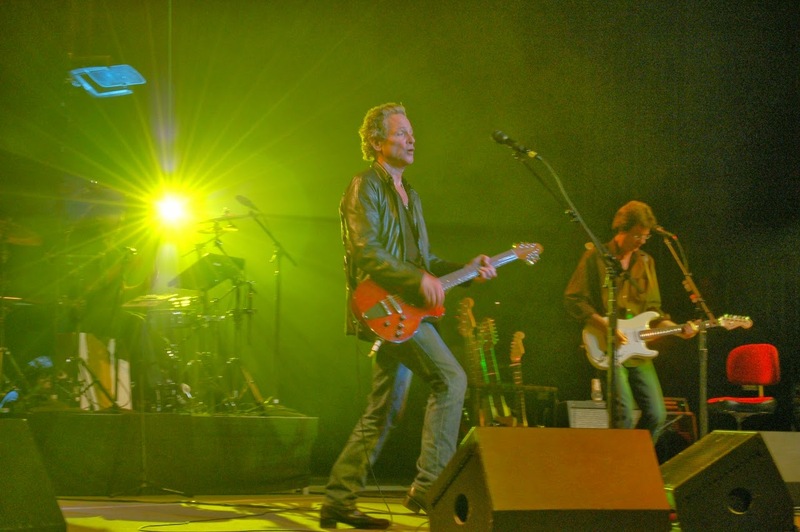 Lindsey Buckingham performed Live in Mobile, AL at the Saenger Theatre on this day March 15, 2007. Actually, in response to calls from his audience Thursday evening at the Mobile Saenger Theatre, guitarist and songwriter Lindsey Buckingham allowed that he'd heard of a band called Fleetwood Mac. And that he liked that group. But he also made it crystal clear that he didn't need his bandmates from that multimillion-selling ensemble to bring listeners repeatedly to their feet. The tour that brought Buckingham to town was designed to promote "Under the Skin," a solo album released last fall. His first solo effort in more than a decade, its tracks consist almost entirely of Buckingham's voice and guitar work. But that description might mislead one into thinking it's straightforward, folksy singer-songwriter stuff. It isn't: Both voice and guitar are processed and piled on in layers for a considerably more complex result. While Buckingham and his three-piece backing band relied heavily on acoustic guitars and vocal harmonies to replicate that sound, the result was likewise electric -- and surprisingly loud, starting at a level that made earplugs advisable and ratcheting steadily upward. While he didn't have the Saenger's biggest crowd -- the venue was a little over half full, with about 1,000 people on hand -- the majority of the audience hung around despite the volume. They enthusiastically greeted the Fleetwood Mac songs with which Buckingham salted the set -- "Second Hand News" and "Never Going Back Again" being two early examples. They also were almost as receptive to his new tunes, thanks in part to introductions that were a shade or two more interesting than the usual "This song is about ..." preambles. "A lot of the songs on this album are about growing up," Buckingham said at one point. "Which is something we're all trying to do, at different rates." Buckingham himself projected the impression not necessarily of a rock star, but of a master craftsman. Without the guitar, he might have been mistaken for a skilled woodworker or a sculptor -- someone not cocky, but completely confident; not flashy, but capable of applying great skill and strength to certain specific tasks. With the instrument, he showed a Promethean willingness to melt down and recast well-known songs, rather than trying to recreate the radio versions. His solo take on "Big Love," for example, was a wailing, screaming workout that earned a standing ovation. He followed that with an almost mournful rendition of "Go Insane" that blended Spanish-style guitar with singing that remade the song as wickedly personal blues: "So I go insane/ Like I always do/ And I call your name/ She's a lot like you." Among Saenger performers in the last couple of years, you'd have to go all the way back to bluesman Buddy Guy, who played in late 2005, to find an artist with a better command of mood, tone and volume. The show was not without its lighthearted moments: At one point, talking about a fight in which his wife turned out to be right, Buckingham picked up good-naturedly on the fact that a woman down front had responded to the story with a loud "Duh!" At another, he used light reflected from his guitar's top as an impromptu spotlight, trying to identify someone else who'd gotten his attention. "I've been introducing this by saying it's kind of a strange song," he said before playing "Red Rover." "And then it occurred to me -- most of the songs I've written are strange." But strange enough to draw a crowd, and, as he proved Thursday, strange enough to hold them.